Product prices and availability are accurate as of 2019-04-06 12:45:08 EDT and are subject to change. Any price and availability information displayed on http://www.amazon.com/ at the time of purchase will apply to the purchase of this product. This ceremonial sage is natural and organic. It comes in loose bundles of leaves that can be used together for any magical ritual or cerimony. White Ceremonial Sage is often used for cleansing - of tools, homes, spaces and even people. General Sage Properties Sage has been used for many years to promote long life. It is said that cooking with sage can make you live longer and healthier. 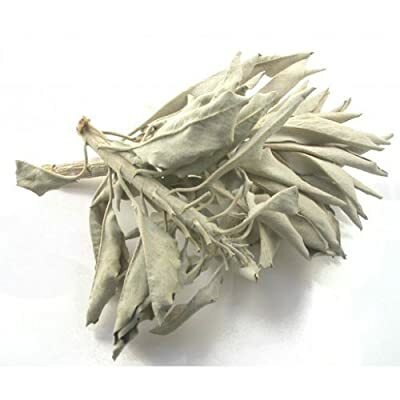 Sage is also carried to promote wisdom and its leaves can be burned in money spells. Visualize money coming into your life, as you hold sage in your hands. An old charm to protect against the evil eye is to wear a horn filled with sage. Sage has been used as a consecration herb for many many years as well. It is well known for its power to purify, consecrate and heal. Properties: Immortality, Longevity, Wisdom, Protection, Consecration, healing.